‘s how they invented so-called history. Wait ‘n’ I’ll put the records straight. The Greek Goddess Artemis – whom the Romans called Diana – is mythology’s arch-outsider: lesbian feminist, environmental activist, radical midwife, shaman huntress, man-slayer when necessary, and like her tragic namesake, called The People’s Priestess. Her twin brother Apollo, despite his extravagant juvenile delinquency, was elevated to god of civilisation, harmony, proportion, and music. 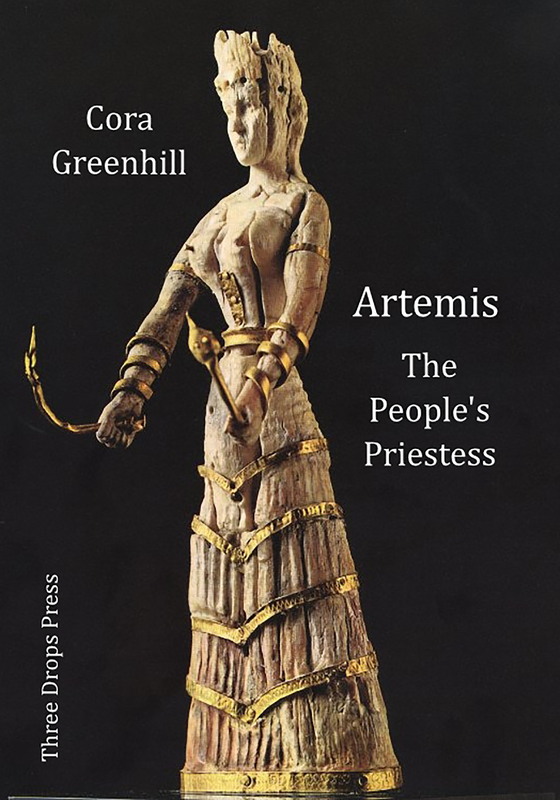 Artemis, The People’s Priestess is currently available from Lulu, or directly from the press by contacting Kate at threedropspoetry@gmail.com. Cora Greenhill has been making pilgrimages to Crete since 1984, when she started her exploration of the pre-patriarchal ‘Minoan’ world. She found this gave her feminism an embodied depth that she expressed through dance and poetry. She has since taken many dance groups to creatively respond to the power of the Cretan caves and ancient sites where ‘the veil between the worlds is thin’. She taught Gabrielle Roth’s 5 Rhythm dancework for over 20 years, after a career teaching literature and counselling. She and her husband now have a home in Crete. In England they have lived in The Peak District near Sheffield for 30 years. She teaches poetry and writing and hosts Writers in The Bath in Sheffield. She wants a gap year travelling to World Music Festivals.